HMH Books for Young Readers, 9780618396665, 80pp. When Abigail Adams asked her husband to “Remember the Ladies,” women could not vote or own property in America. Some seventy years later, when Elizabeth Cady Stanton wrote, “To vote is the most sacred act of citizenship,” the government of the United States still did not treat women as equals, having yet to grant them the right to vote. But sixty-four years after that Geraldine Ferraro declared, “We can do anything,” and became the first American woman to run for vice president on a major party ticket. 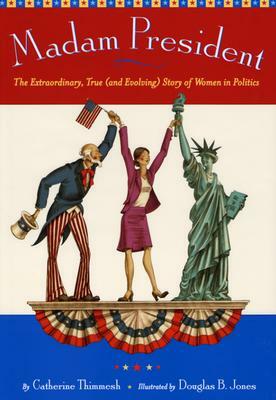 Today, surely our country is ready for a leader who, as Elizabeth Dole said, “will call America to her better nature.” This captivating book illuminates the bravery and tenacity of the women who have come before us. With an engaging narrative, fascinating quotes, and elegant illustrations, it not only shows how far women have come but also reveals the many unsung roles women have played in political history Step by step, these capable ladies have paved the way for our young leaders of tomorrow. They have enabled and empowered us to ask today: Well, why not the presidency? Catherine Thimmesh is the award-winning author of many books for children, including Girls Think of Everything and Team Moon, winner of the Sibert Medal. Her books have received numerous starred reviews, appeared on best books lists, and won many awards, including the IRA Children's Book Award and Minnesota Book Award. She lives in Minnesota with her family. www.catherinethimmesh.com. A lively introduction to women's political achievements. A sassily organized and argued rallying cry for girls-soon-to-be-women to stake a claim for Executive Office. Thimmesh treats subjects from every point on the political spectrum with enthusiasm and respect...an excellent primer in international women's political history. A good choice in this election year, Madam President is an entertaining and informative choice.